Since its introduction in 2001, the Freak collection has included exceptional timepieces demonstrating the avant-garde approach to watchmaking of Ulysse Nardin. Just to mention a few innovations, the Freak was the first watch to incorporate a silicium escapement in 2001, a diamond escapement in 2005 and the Dual Ulysse escapement the same year. 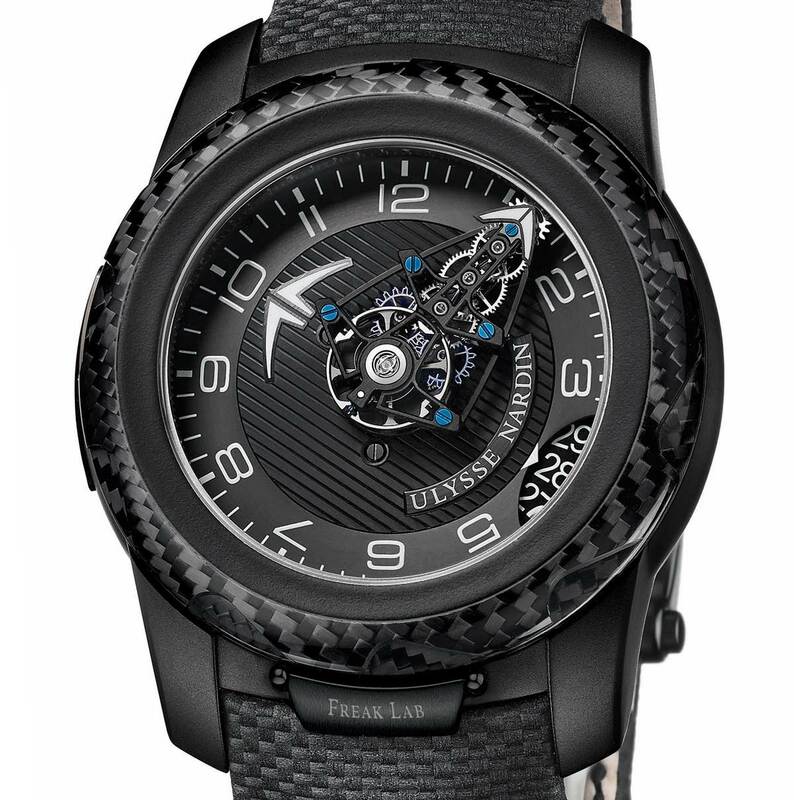 At Baselworld 2015, the watchmaker based in Le Locle presented the latest evolution of the collection, the FreakLab, which brought the balance wheel back to the centre of the dial compared to previous models as well as introducing a date function and the UlyChoc safety system, a new generation of shock absorbers designed, developed and produced entirely in-house. Now, Ulysse Nardin announces the FreakLab Boutique Edition, a limited-edition of 99 pieces which maintains the same technical specifications of the FreakLab while introducing a new implementation of special materials like carbon fiber and blackened titanium. Carbon fiber is used for the bezel while middle case and horns are crafted from blackened titanium. The diameter of the case is 45 mm. The rotating bezel is freed via a safety clip at 6 o’clock and can be used to set the hours and minutes when rotated clockwise or the date when rotated counter-clockwise. The back bezel winds the mainspring barrel, which is designed to guarantee 7-day power reserve. One full rotation is equivalent to 12 hours of power reserve. The two bezels are integral parts of the Calibre UN-210 movement beating at 28,800 vibrations per hour and featuring the dual escapement, non-lubricated, in silicium. The black leather strap reproduces a carbon fiber motif to match the bezel. 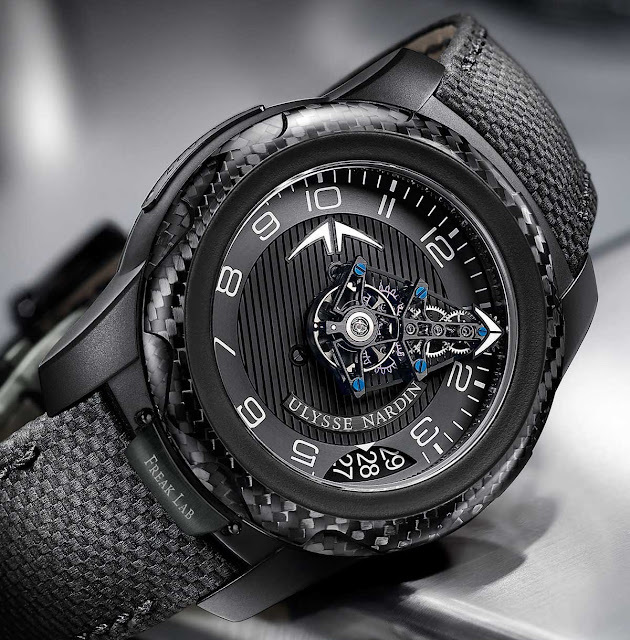 Ulysse Nardin FreakLab Boutique Edition. 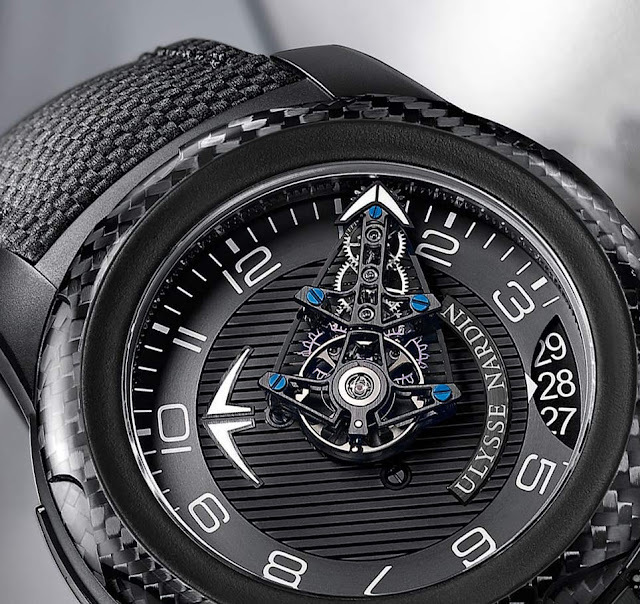 Since its introduction in 2001, the Freak collection has included exceptional timepieces demonstrating the avant-garde approach to watchmaking of Ulysse Nardin. 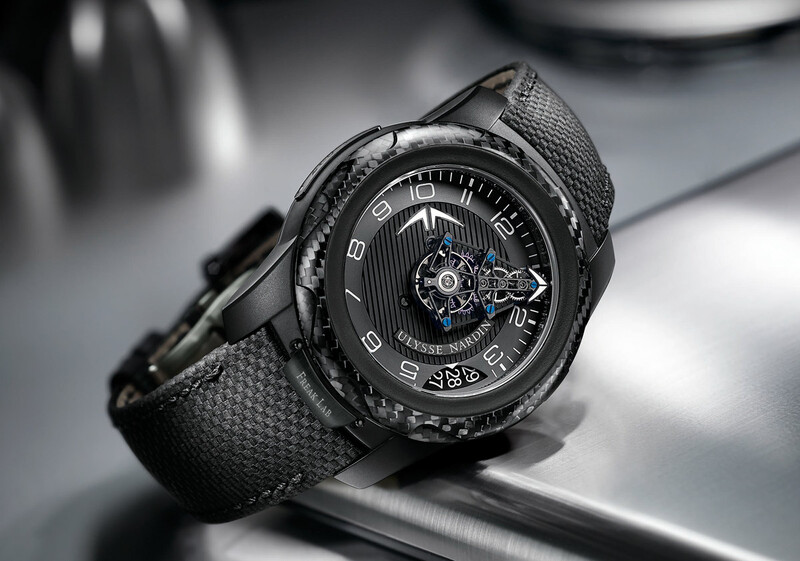 Ulysse Nardin announces the FreakLab Boutique Edition, a limited-edition of 99 pieces which maintains the same technical specifications of the FreakLab while introducing a new implementation of special materials like carbon fiber and blackened titanium. The new FreakLab Ref. 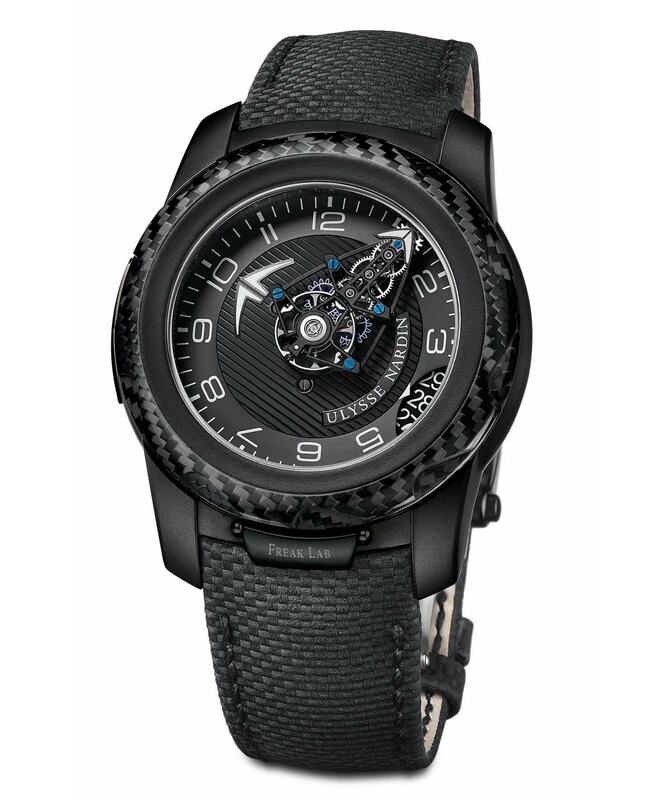 2103-138_CF-BQ is exclusively available at Ulysse Nardin boutiques worldwide. Price: Euro 75,000 / US$ 75,000.